I don’t write about it often any more, but I am a rather frugal person. Not only has necessity made me that way, I actually truly enjoy finding bargains and deals. While I don’t coupon near as much now as I use to, I do still watch sales, find good prices and stock up when I can for future days when it may cost more. One thing however, that I have loved as far back as I can remember, is shopping at thrift shops or finding great deals at yard sales. I have always loved digging through the junk to find the treasure. This past weekend, we actually spent nearly all day Saturday going from thrift shop to thrift shop in our area. We are always on the lookout for great used furniture, but this trip was more to grab some clothes for the Wee Child and to check out props for upcoming blog posts, recipes and projects. Since we got such great deals, I decided to share with you these 5 Great Things To Buy At Thrift Shops. While I will check out any thrift shop in town, we actually prefer the “branded” ones. Goodwill and Savers both offer organization that my OCD brain has to have, as well as in certain areas much higher quality product at a low price. Goodwill has the best overall prices as they simply set standard prices for categories instead of individual tags. That means I can find a pair of Ralph Lauren jeans for my son for $2.50 there instead of the $12.99 they might be at Savers. Either place has great deals and reasons to shop there. 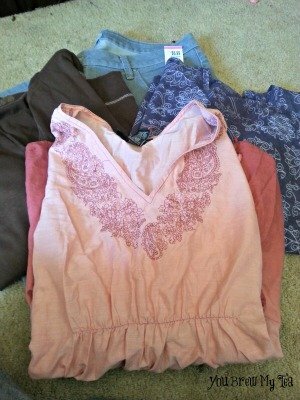 Plus Sized Clothing: Seriously the best place for me to find deals on quality clothes in plus sizes are at thrift shops. This week, we went to a few places but found 3 winter shirts and a pair of jeans that fit. brands like Liz Claiborne, Lane Bryant and Torrid. I paid only $2.50 each for the shirts and $3.50 for the pants. That is more than 90% Off on the pants alone. All in excellent condition with one shirt still carrying the tags as it had never been worn. I have better luck at Goodwill in the, ahem, not so nice areas of town when looking for plus size clothing. I know that may seem judgemental or prejudice, but it has been my experience that the donations in those areas tend to have a larger amount of plus size clothes. However, I will say I find the nicer brands in the nicer parts of town. It’s worth looking at all of the thrift shops in your area and always watch for designated plus size areas so you don’t have to weed through sizes that are too small for you. 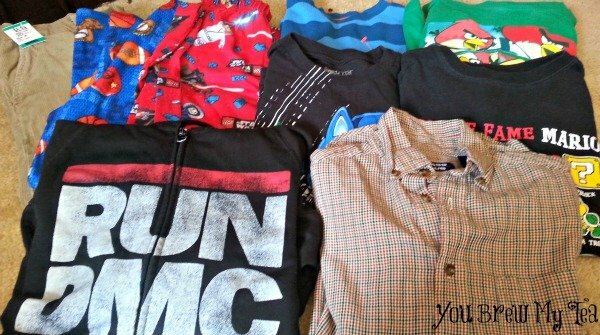 Kids Clothing: While we buy a lot of new items for our son, I love supplementing his wardrobe with fun things like graphic tees, hoodies, sweatshirts and cargo pants at thrift shops. I find that jeans tend to show a lot of wear when used, but there are often a lot of great graphic tees for $1-$3 that are in great shape. This weekend we bought the Wee Child 1 pair of pants, 2 pajama pants, 4 long sleeve graphic tees, a button down shirt and a funny yet functional Run DMC hoodie (which still had tags on and retailed for $53.99 – we paid $2.50). We spent only $17.50 for all of this and it was all in nearly new condition if not brand new. This was perfect for filling in the gaps where he needed some “play shirts” for winter. Home Decor : This is one thing that can be really hit or miss at a thrift shop. Home Decor may simply be ugly, but on occasion you find some real treasures that suit your needs. We have been looking for a flat basket for putting rolls/bread in for pictures here on the blog. This one for only $.50 was ideal. The mini picnic basket appealed to me for future picnic posts as well as to go in our office and tucked with healthy treats while we work. The 2 turkeys were just cute as a button and I see an upcycle project with them in the future. For $1 they were a steal. The best tips are to know what you are looking for, as well as what the original price for something might be. Also remember a lot of items can be repurposed. You might hate the picture, but you love the frame. For the right price the frame could be worth it to be used in future projects. Games: The best part of this trip though, were the two games we grabbed. KISMETT was the precursor to Yahtzee. Not only was the box in great shape, it included all pieces, the original tally sheets and pencil! It isn’t worth as much as I thought it would be, but it is perfect for our game collection. 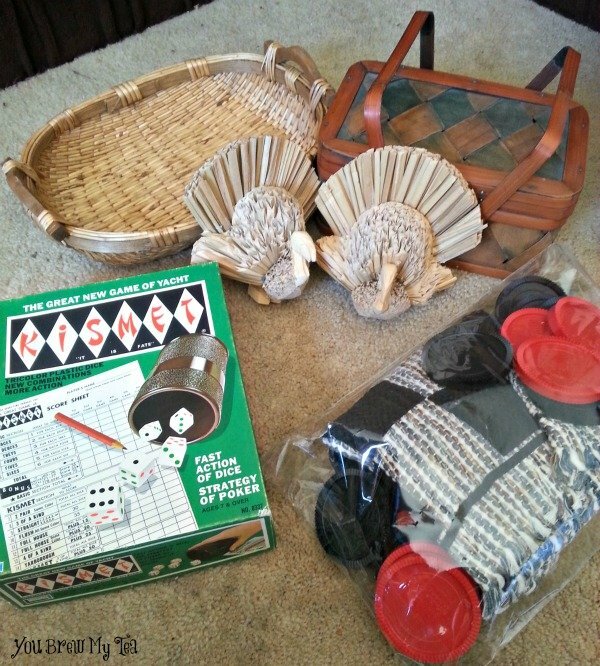 The giant checkers set was only $2 and great for afternoons of fun with the boy! Games can be hit and miss much like home decor. Watch for new in package, count pieces and needed supplies. Finding full sets or complete games can be rare, but when you do it’s a great inexpensive way to add to your family collection. Books: This is often my favorite thing to find at thrift shops. Goodwill has set prices for kids books, hardback and paperback. 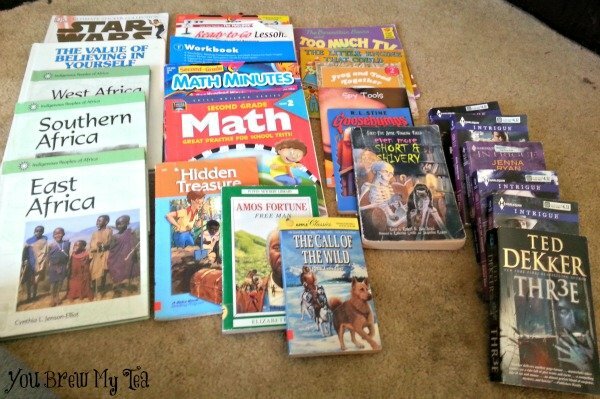 Grabbing kids books for only $.50 each is a great way to fill their library. Savers has a Buy 4 get 5th for Free program we love. Their prices are a bit higher, but on some items of specific paperbacks they only charge $.49 per book! While I don’t read a lot of romance novels, I have friends who do and these were great deals to go in gift baskets – especially since they were all in brand new condition! We really stocked up at Goodwill this weekend on stuff for homeschool though. We managed to find 17 books for $13! Complete curriculum workbooks that had never been written in, great books about South Africa and a few random readers that the Wee Child picked out. These are all great for review, practice reading and the Science workbook fits perfectly into what I already had planned for this year. In the end, I spent $70.64 on over $400 in clothes, books and home decor. Everything we bought was something we needed, and much has already been put to use in our home. I know people probably think it is tacky, but I am most excited about the 5 books I grabbed that were brand new to go in a gift bag for a friend! I know she wouldn’t care that they were thrifted. She would appreciate that I thought of her when I was shopping! Take advantage of your local thrift shops for great deals. Sometimes you have to over look clutter, disorganization and items that you don’t or need to find these great things to buy at thrift shops! We love the deals we have found, and plan to continue shopping at our local thrift shops! 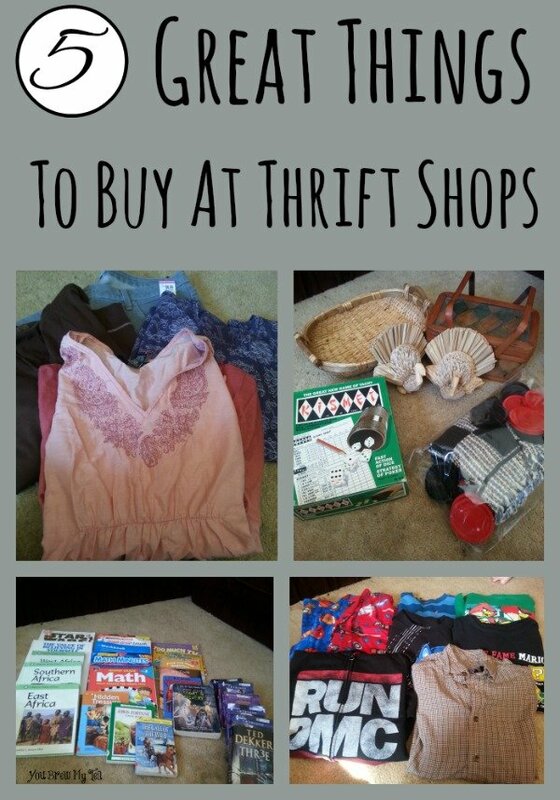 Check out our other great post on thrift shopping! What Are The Best Deals At Your Local Thrift Shop? What is your favorite thrift shop find? Previous Post: « Are You Feeding Your Kids Enough Or Too Much? Such great tips! I love thrift stores for the treasures you can find. It can really help stretch the budget. I love that you added games. Last year, shortly before Christmas I found an original Cooties game for one grandie, and a Pirates of the Caribbean game for the other. Both were brand new, still had the plastic on them….and I paid 3 dollars each. Once I got home, I looked them up online, and found out the Pirates game was originally 50 dollars and Cooties was 20. Half the decor items in my house are from thrift stores too. I also buy lots of things to upcycle into crafts. This post just really hit home. Thanks for sharing I have a closet of thrift store finds mostly new tops and some jeans a few dresses saves tons of money for Bills since things have gone up my clothing budget took a hit I take my used stuff in that I don’t wear and use the money for newer clothes that I will wear! I also use Posmark for my better stuff! Have a Great Day ! Shopping at Thrift stores is one of my favorite things to do! I’ve always done most of my shopping there for kids clothes and our own. I can spend hours in there! I probably did 85% of my Christmas shopping there last year. Many things still new in package or with tags still on. Even games that might be missing pieces are great to replenish missing pieces to a game you already have – we’ve done that a lot. I have a son whose is majorly into New England Patriots and we have found brand new, clothing items, still with tags for a fraction of the cost. One of my favorite purchases would be a green corduroy jumper (for wearing to Church in the winter) and in the pocket was a $10 bill! Binders can be a very good deal when a 2″ Avery one at Staples is $13.99-$15.99. I haven’t bought a new dress in a “regular store” since 1996, nor jeans in a store since 2000. Another thing I do is watch for sheets, curtains, pillowcases, and bed-skirts with pretty eyelet ruffles, buy them and take the ruffles off and attach to my granddaughter’s dresses so she can wear them longer (adding length to the hem). A yard of wide eyelet costs $4.99+/yard in craft stores. I am all into Repurposing! Sadly, I rarely have luck finding kid clothes while thrifting, but I have strolled into the kitchen section and found awesome deals. A Wilton Cupcake Maker for $5!!!!! This is Wilton we are talking about and it was only $5! Also found a 4 piece dish set for my daughter for like $12! Awesome Sauce. That’s a great series! Love your posts! Love Thrifting and your post! I actually did a summer series on “The Thrill of the Hunt” talking about what is consider treasures for me and from some other pros. Isn’t exciting when you find that one thing you’ve been looking for and it’s a deal?! I love shopping thrift stores each holiday when it comes to decorating time! I haven’t gone thrifting in awhile. I only go when I have a caregiver/nurse for my daughter because this is my time to go treasure hunting! LOL Sine her caregiver moved, I haven’t been able to but I would find AWESOME deals on music, DVDs, books, vintage clothing, etc but my all time favorites are Estate Sales. Man…. smoking deals. I bought 5 HUGE boxes of mystery/thriller/fiction/cookbooks books for $2. They were big names. I took the ones I already read or owned to a used book store that netted me a $75 trade credit. SCORE! Oh how I love great book deals! Especially when the books look like they have never been read (the ones I got last week). PERFECT for gift giving! !